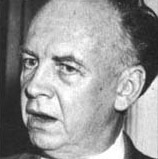 Louis Francis Budenz was a member of the Central Committee of the CPUSA, former editor of the newspaper Daily Worker, professor at Fordham Catholic University. Budenz defected to the FBI in August 1945. This page was last modified on 13 July 2016, at 10:31.